in numerous literary journals, anthologies, and encyclopedias. His work as a visiting poet in elementary and secondary schools and community arts programs has been documented in New Jersey English Journal and in books from Teachers & Writers Collaborative, including Classics in the Classroom: Using Great Literature to Teach Writing (1999) and The Alphabet of the Trees: A Guide to Nature Writing (2000). self-published by Higginson -- as "Hian", 1968). the kinglet weighs . . . Credits: [incomplete] "Holding the water" - Haiku West 3:2 (1970);The Haiku Anthology (ed. Cor van den Heuvel, Anchor Books/Doubleday, 1974); The Haiku Anthology (ed. Cor van den Heuvel, Simon and Schuster, 1986); Ten Years Collected Haiku Vol. 1 (From Here Press, 1987); Haiku Moment: An Anthology of Contemporary North American Haiku (Bruce Ross, ed., Charles E. Tuttle Company, 1993); The Haiku Anthology (ed. Cor van den Heuvel, W.W. Norton Company, 1999); upright in the washout [a posthumous collection of the haiku of William J. Higginson] (Jim Kacian, ed., Red Moon Press postscripts series #9, 2008); "the kinglet weighs: - Modern Haiku 36:3 (from haibun, 2005); "the tick, tick" - Modern Haiku 20:2 (1989); Haiku Moment: An Anthology of Contemporary North American Haiku (Bruce Ross, ed., Charles E. Tuttle Company, 1993); upright in the washout [a posthumous collection of the haiku of William J. Higginson] (Jim Kacian, ed., Red Moon Press postscripts series #9, 2008); "writing again" - The Haiku Anthology (ed. Cor van den Heuvel, Simon and Schuster, 1986); The Haiku Anthology (ed. Cor van den Heuvel, W.W. Norton, 1999); Still 2:1; Summer Surgery/Waiting (by William J. Higginson and Penny Harter, From Here Press 2005); upright in the washout [a posthumous collection of the haiku of William J. Higginson] (Jim Kacian, ed., Red Moon Press postscripts series #9, 2008); "New Year's Eve" [after Bashô's met with thieves] - Frogpond 17:4 (1994); upright in the washout [a posthumous collection of the haiku of William J. Higginson] (Jim Kacian, ed., Red Moon Press postscripts series #9, 2008); "thump and screech" - Heron's Nest Award: The Heron's Nest 2:7 (2000); "the fence post" - The Haiku Anthology (ed. Cor van den Heuvel, W.W. Norton, 1999); upright in the washout [a posthumous collection of the haiku of William J. Higginson] (Jim Kacian, ed., Red Moon Press postscripts series #9, 2008);"delicate bones" - Frogpond 20:2 (from sequence for Geraldine Little, 1997); upright in the washout [a posthumous collection of the haiku of William J. Higginson] (Jim Kacian, ed., Red Moon Press postscripts series #9, 2008); "spring rain" - Modern Haiku 36:3 (2005); upright in the washout [a posthumous collection of the haiku of William J. Higginson] (Jim Kacian, ed., Red Moon Press postscripts series #9, 2008); "The clock" - Ten Years Collected Haiku Vol. 1 (From Here Press, 1987); Haiku Moment: An Anthology of Contemporary North American Haiku (Bruce Ross, ed., Charles E. Tuttle Company, 1993). Additional Reading: (a partial list): "Haiku Is Mainstream" (with Penny Harter), Modern Haiku 37:3 (2006); "Haiku by the Numbers, Seriously" (critical/historical essay), Haikai Home web site; "Net Kasen Renku: Summer Haze" (experimental multi-dimensional poetry) with Paul Terrance Conneally and Peggy Willis Lyles, Renku Home web site; "Less is more: Haiku is flourishing in the Internet age" (article on history and current situation of haiku in English): The Writer (September 2001, 20-23); "The 'Webolution' of Haiku" (portions of keynote address from the Global Haiku Festival, Millikin University, Decatur, Illinois, April 15, 2000); Temps Libre web site, http://www.tempslibres.org/aozora/en/hart/hart08.html; "thump and screech" (haiku, "The Heron's Nest Award" with editor's comments; The Heron's Nest 2:7 (online and print, July 2000), (August 2000); "Selected Tanka Bibliography with Notes" (expansion of the bibliography published with article "Tanka: With Feeling," Gerald England, editor: The Art of Haiku 2000 (UK: New Hope International, 2000; page put up January 24, 2000); "The concerns of a half-century career" (review of The Gary Snyder Reader by Gary Snyder (Washington: Counterpoint, 1999), (The Santa Fe New Mexican, November 7, 1999, F-2); "Legatura si schimbarea: ghid practic pentru compunerea poemului renku" [Link and Shift: A practical guide to renku composition] (how-to) co-authored with Tadashi Kondo, translated by Mihaela Codrescu (Albatros/Albatross, combined issue whole numbers V and VI (Constantsa, Romania, Spring 1996-Winter 1997, 124-136); "The Four Seasons in Santa Fe" ([personal essay with 8 haiku, with a Japanese translation by Hashimoto Kayoko] (Suimei, 70:4 (Urawa, Japan, Apr. 1997), 36-41); "Haiku Compass (U.S.A.)" [selection of 13 haiku by U.S. poets, including "the withered iris" by Higginson, presented with Dutch translations] (Vuursteen: tijdschrift voor haiku, senryû en tanka 15:3 - Best, Netherlands, Autumn 1995, 114-115); "Kasen Renku: The Full Moon" co-coordinator with Penny Harter-winner, 1993 HSA Renku Competition. Frogpond, 17:1 (Spring 1994, 15-18); "A Sense of the Language" [essay] (Blithe Spirit, 3:3, Northumberland, UK, July 1993, 10-11); "Bashô Kikô" ["Bashô Travel Diary"] (Japanese translation by Kondô Tadashi of travel diary with haiku by William J. Higginson and Penny Harter of visit to Bashô-related sites in Kyoto, Ueno, and Otsu, Japan): Haiku Kenkyû, 56:10 (Tokyo, Oct. 1989, 176-179); Itadakimasu: Essays on haiku and senryu in English (J & C Transcripts, 1971); Cycling Paterson: a Haiku / Senryu Sequence (Seer Ox, 1974). Sources Biography: Penny Harter; biographical and autobiographical information posted on Higginson's Web site http://www.2hweb.net/; upright in the washout (ed. Kacian, Red Moon Press postscripts series volume 9, 2008). 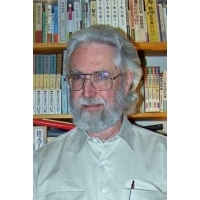 Appreciation is also due Charles Trumbull for assistance in gathering representative haiku and publication credits.